New York circa 1913. "The Singer Building." 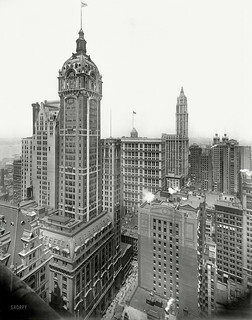 Rising in the distance, the Woolworth Building under construction. Detroit Publishing Company. Submitted by Eric S. on Sun, 10/17/2010 - 1:11pm. It's a terrible aesthetic loss but the sad fact is that a building this old generally has severe handicaps for use today. Simply rewiring it for modern power (not to mention adding modern phone and computer lines) is a tremendous expense- everything is buried under plaster and masonry. These old buildings were firetraps- vast improvements over their predecessors but still dependent on someone finding a hose or fire extinguisher not all of these buildings had sprinklers. Most of these buildings depended on an open window for cooling in the summer- to refit a structure like this for modern use you've often got to strip the interior to the skeleton. Even if you could do everything needed you're up against the reality of life in NYC- the occupancy of the building might be too small to bring in enougfh money to cover costs and taxes. It's a sad thing. Submitted by bigguy1960 on Sun, 10/17/2010 - 11:11am. Even by 1967 standards, which are much much looser than today's standards, the building is not a viable commercial property. Look at how SMALL the floors of the tower are - now subtract space for ( 4 ) modern elevators, ( 2 ) fireproof stairways as far apart as possible, restrooms, an exit access corridor, plus space for structural columns, ventilation, air conditioning and heating equipment, and what you have left is somewhat less than half of the floor space for rental. This means you would have to charge exorbitant per-square-foot rent just to recover the renovation costs. Maybe today you could get away with it, just for the cachet of an exclusive address, but not in 1967.